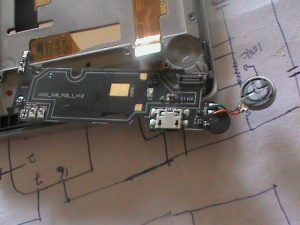 just as we explained on how to fix Nokia 730 USB and and how to fix water damage phones we continue that way to bring this latest phone Tecno C8 camon that is having power or booting problem. Unlike Tecno Y6 power problem this is a little bit different the you are working with an in-bult batteryphone. So much care should be taking to avoid causing more harm to the phone in question. 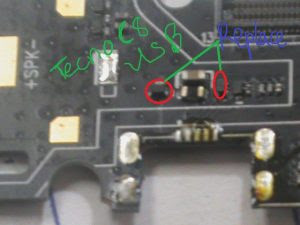 Just follow the steps below to fix this Tecno C8 USB problem yourself. Disassemble the phone or take apart the smart android tecno c8 and check for all the clip connected together. Unclip the charging port section. 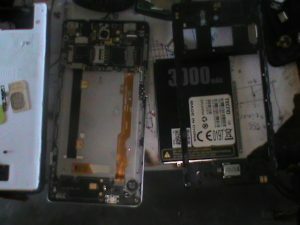 As aour concern is charging port we have to disconnect the charging port flex connector from the main panel. This is done for safety reasons. The next thing to do is to power your Rework Station and allow it to heat. then carefully remove the charging port connector. Check for broken terminals on the charging port. Read the charging port and confirm if is in good condition. If yes then the problem is fron the board. 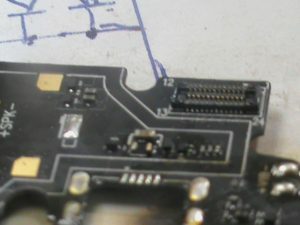 As we have seen that the problem is not from the charging is time for you to replce these two marked components one resistor and one capacitor. After changing the components the next thing to do is to use Rework Station again to replace the main charging port. When this is done, test the output voltage of the change charging port with probe and see if is 5.0V. if you follow the steps as explained the you will start using your Tecno C8 camon again direct to charging socket. please spread the love far and near. Say thanks to the phone doctor. Note: the phone selects charger.